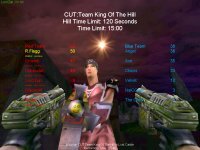 In dedication to a very fun Q2 mod, the Chaos team has decided to bring King Of The Hill (KOTH) game type to Unreal Tournament. In a KOTH game the object is to find the “hill” and stay on it for as long as you can. KOTH games do not reward frags as the emphasis here is hill time. In order to stay on the hill you will need to defend it against other players/bots who are intent on taking it from you. We have also provided a Team KOTH where you can work with others to defend or take the “hill”. 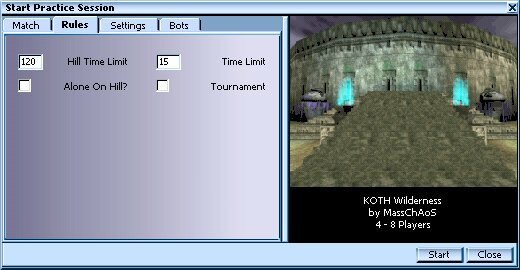 All KOTH games are time based so don’t spend your time foolishly. 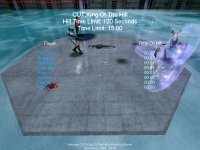 Simply select CUT: King Of The Hill, or CUT: Team King of The Hill from the Game Type list. UT will then automatically load the KOTH maps. 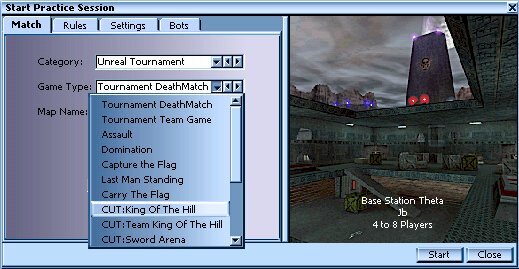 Select any KOTH map and hit the Start button. If you wish, you may hit the Map List button first, and create a map rotation list using any other KOTH maps that you have installed. 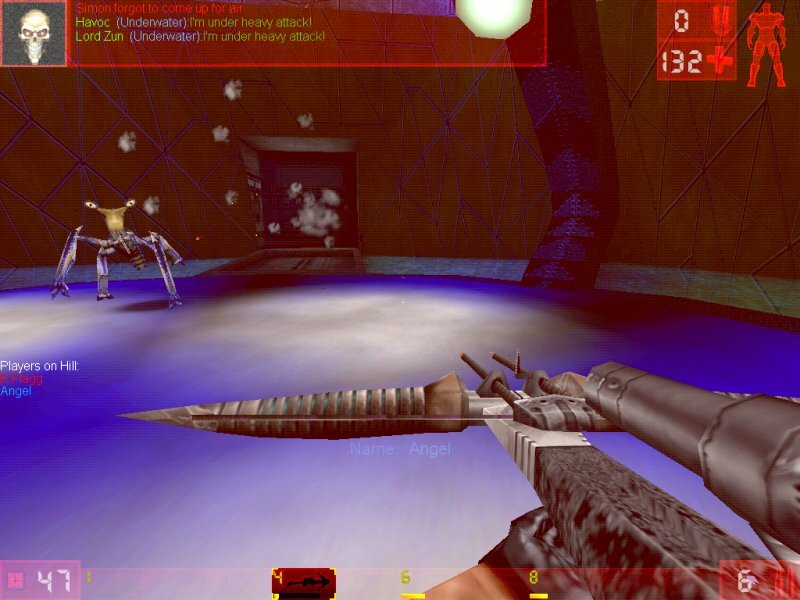 The ChaosUT main mutator is automatically loaded in KOTH games. Next, go to the rules in order to finalize your KOTH game. 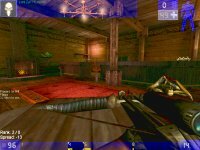 Time Limit – Same as standard UT. 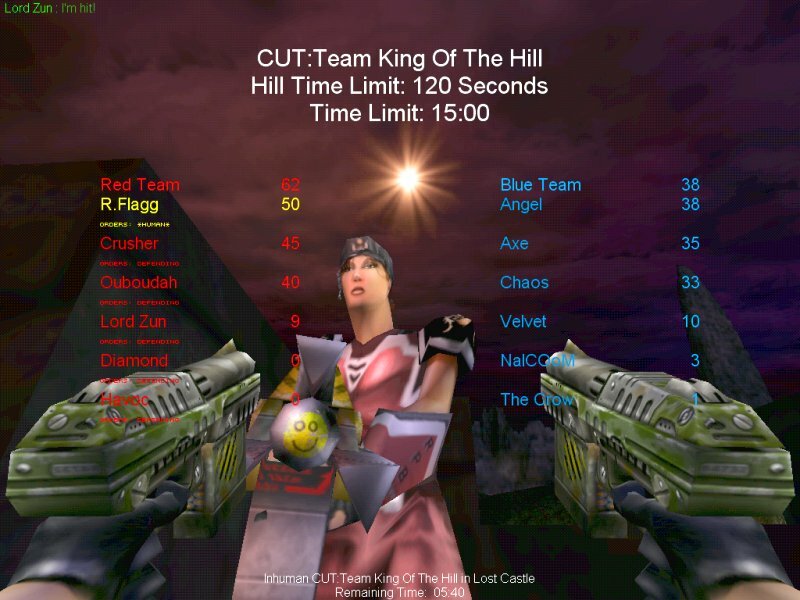 If no player has reached the Hill Time Limit, the player with the most Hill Time will be declared the winner when Time Limit is reached. Tournament – Same as standard UT, each player must click fire before match begins. Alone on Hill – Check this, and you must be alone on the hill to score Hill Time. 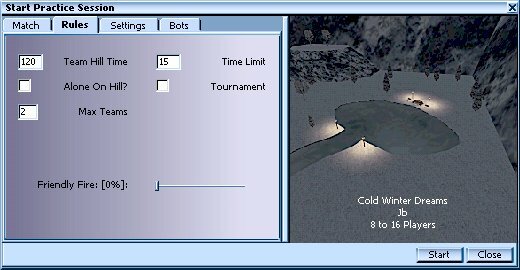 Team Hill Time – The amount of time your team must be on the hill to win the game. Time Limit – Same as standard UT. The team with the most Team Hill Time is declared winner. Alone on Hill – Check this, and your team must be alone on the hill to score Team Hill Time. Max Teams – Choose between 2, 3, or 4 teams. Friendly Fire – Set the amount of damage teammates weapons will do each other. The “hills” are predefined places in the map. A readme of the maps will tell you where the hills are in the maps. In addition, all of the KOTH maps from the Chaos team will have the level screen shot that has the hill(s) in sight. Players will start out with no weapons but with respawn protection. This will help to protect you from spawn campers (remember spawn campers get no credit for frags and aren’t earning hill time). Weapons will be placed on route to the hill or other places in the maps. You might have to go looking for power ups. And since players start with no weapons, “Weapons Stay” is forced ‘on’ in KOTH games, so there will always be one there for you to pick up. In the event of a tie game in regular KOTH, the game goes into overtime until the tie is broken. If a tie should occur in TeamKOTH, the team with the player that has the highest individual score is declared the winner. If however we have two players, on different teams, with the same individual score, the game will go into overtime until one player breaks the tie (either with a frag, suicide, or hill time). We have made some changes to the scoreboard and the HUD to give you some information that you’ll need in a KOTH game. When you are on the hill, you’ll see a message on your screen letting you know you’re there. A list of players currently on the hill will be displayed on the lower left. The frag counter has been replaced with a Hill Time Indicator. The Hill Time Indicator will display the number of seconds you’ve been on the hill beside a small clock icon. individual score is a combination of your Hill Time and frags. The list of players currently on the hill is still displayed, but with their names color coded to match their team. There will be an icon for each team on the right hand side, showing each teams total Hill Time. Team scores reflect only the total Hill Time earned by the team, frags do not count. Individual scores are provided, but are only used in the event of a tie game.